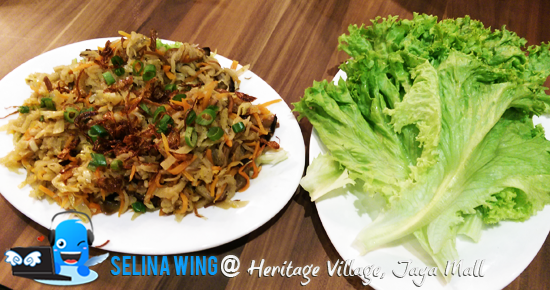 Hungrygowhere invited me to attend the Heritage Village Nyonya which located at Jaya Shopping Centre, Petaling Jaya on last 31 July, 2014 for the food tasting review gathering bloggers. I surprised to get know the Jaya shopping re-open to all residents again so I happy to see it bring back our family's memories! I still remembered that my mom bring me went to visit a very old Jaya shopping mall since I was kid, and my family stayed in Petaling Jaya before we moved out to Penang. My mom and I explored the Jaya shopping mall, it really are different and get more bigger space than last time, so it is very better! 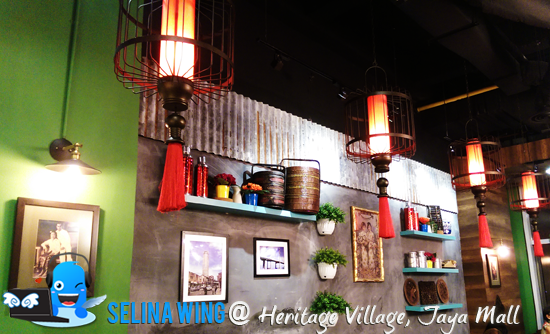 We walked to the Heritage Village, which located at level 3, then we amazed with the beautiful theme nyonya which suitable for the Heritage Village restaurant! I was very happy to meet Siah Yi Ling, my ex-classmate from Multimedia University again! Finally, we meet each other after long 7 years ago! 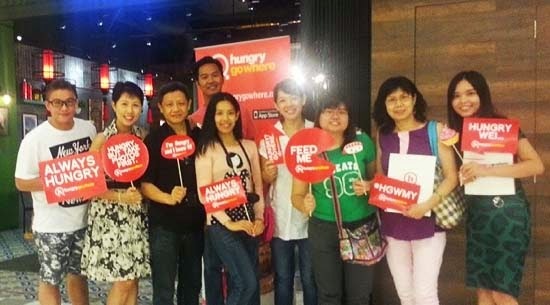 She are new to work with Hungrygowhere, so cool! 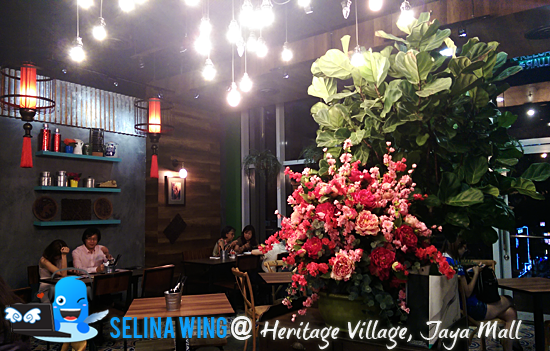 I greeted by Yi Ling and a staff of Hungrygowhere so very warmly. She introduced the bloggers to me and my mom during we waited for the Nyonya dishes come! 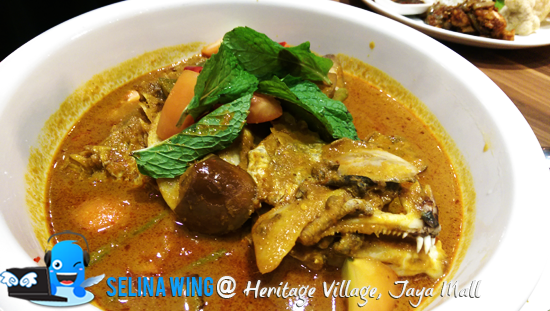 Do you know what is Nyonya culture? It means Peranakan culture (Babas & Nyonyas) with the assimilation of cultures from the inter marriages of Malay and Chinese dating back to early 15 century. So, they carried their own culture food is a class of its own resulting from the fusion of many traditional ingredients of Chinese food and Malay spices and herbs! My grandma's family also come from Peranakan culture (Babas & Nyonyas), so my mom and I are Chinese of Hokkien & Nyonya family! We tried to eat a famous Heritage Village's nasi lemak from a traditional method of steaming rice with fresh coconut milk with herbs and spices! So the founder's family heritage secret was begining in 1998, a founder's family served the nasi lemak from a food stall in the coffee shop, over a span of 3 generations of its founder's family, Madam Molly Khoo. 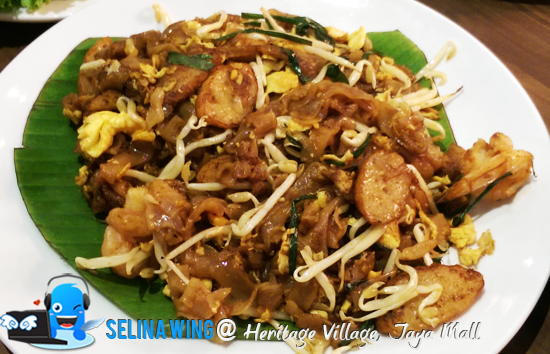 It is become popular after she passed her family's hearitage to her family until today, it be a taste of a traditional Penang Nyonya Heritage! 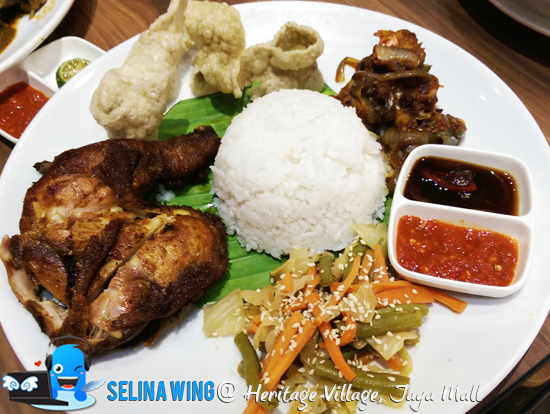 For me, the Nasi Lemak are very special; "Heritage Nyonya Plate" and "Heritage otak Fried Rice" as high recommended for the Nasi Lemak lovers! First time, I see the rice fried with the Otak-otak served with fried chicken, egg and pie tee! So delicious! 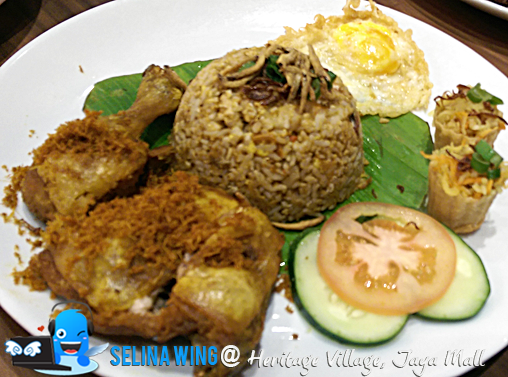 I also love a taste of fried chicken from "Heritage Nyonya Plate"! I surprised that their idea are good to combine the Sambal Sotong, Chicken Rendang and Acar Awak at same time. 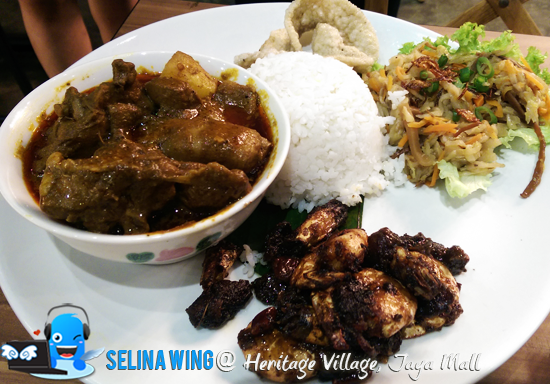 I like to eat the Chicken Rendang so very tasted chili! This is my favorite dish, Heritage Baba with Jiu Hu Char, Assam prawns and curry chicken! Especially, I like the curry chicken and Jiu Hu Char if both are inside my mouth so yummy! My mom likes to eat assam prawns so much. I still remember that my sisters and I loved to eat Lor Bak, which made by my late aunt on everytime since we stayed at my late grandma's home in Penang.We raised by my dad's grandma and relatives in Penang, as we have sweet memories like Nyonya dishes cooked by my late aunt. That is why the Lor Bak is a high-MUST to eat when we always back to our hometown in Penang on many times! Nyonya Lor Bak, made up of fried tauhu, lor bak, century eggs with pickled ginger and fresh slices of cucumber. My family and I really miss it so much! 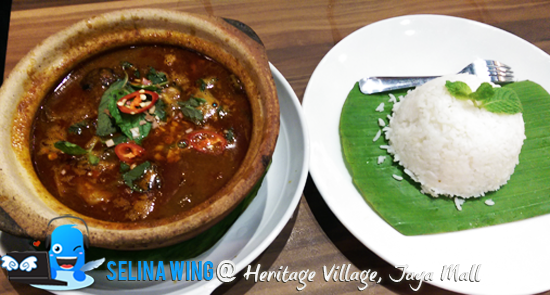 Assam Pedas fish is a classic nyonya spicy and sour dish, served with white rice. My dad loves to eat the assam pedas as always. Sometimes, my sisters and I eat the assam, because we cannot stand more spicy! That is why my parent are Nyonya, they can eat it so well! My mom and I surprised a big head's fish are inside the Nyonya curry with tomatoes, brinjals and ladies fingers! I think that the curry sauce are tasted so thick but, it is nice but my mom prefer the Assam Pedas fish is better. My mom told me that its smell duck egg! but it already lost the taste of penang char koay teow...I tried to eat the char koay teow, so I think that it is good, not more oily. I am not noodle lover, bad. Haha. 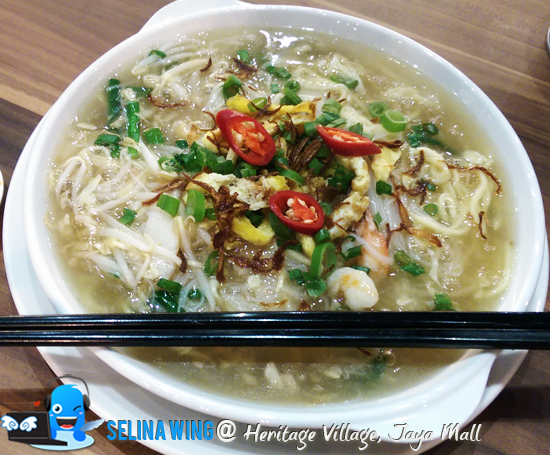 My family and I always love to eat the Penang Assam Laksa Mee. 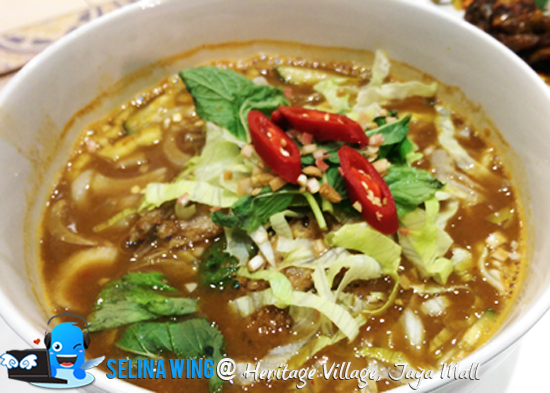 We can see Assam Laksa is made up of a thick rice noodles served in aromatic fish-based tamarind broth topped with shredded pineapple, cucumber, mint leaves, lemon grass, onion, lettuce and assam flower. It also added more pieces of fish, its really nice and delicious to taste so different! My mom love to eat lam mee and asked me to try but I was full already! Lam Mee is made up of thick clear chicken broth served with yellow noodles topped with prawns, fish cake, omelette slices and chicken slices. Wow, the ABC added with durian and ice-cream, so they make a beautiful pink color around ABC, more like the strawberry and vanila+ white bubbles so yummy! I don't like to eat durian. But, I enjoyed it without durian because I like the taste of gula melaka are inside! For me, the Durian Cendol is okay. I am not Durian fan. Haha. I surprised that many big red beans inside the cendol! 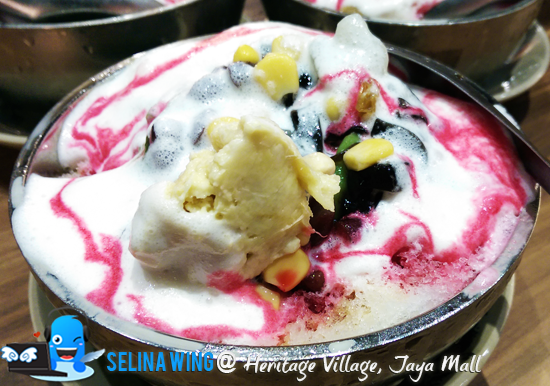 Everyone sure love the red beans and Durian if they want to eat Durian Cendol! Lastly, my family and I really love Bubur Cha Cha. 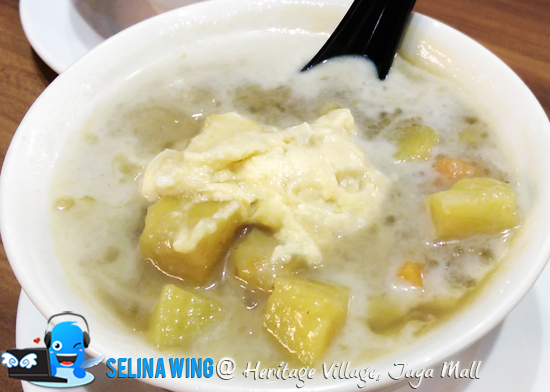 That is why my mom and I enjoyed to eat Heritage Durian Bubur Cha Cha - you better try it as high recommended because it is very best dessert! 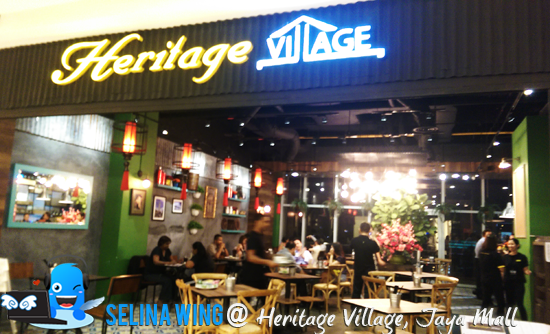 After we enjoyed the delicious Heritage food and delicious desserts, my mom and I get to experience a good service by the Heritage Village's staffs and Peranakan special dinner - really different!